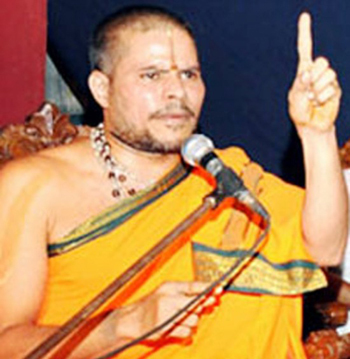 Mangaluru, June 08, 2016: Reports state that Sri Rajashekharananda Swami, pontiff of Vajradehi mutt, Gurupur, has condemned in strong words the stand taken by the government in Kudligi former DySP Anupama Shenoy’s case. The seer said on June 7, Tuesday that the government has totally succumbed to the liquor lobby and the careers of honest officers like Anupama Shenoy are being dumped as thrash. Shenoy was trying to control the liquor lobby in Kudligi and had conducted 50 raids and booked 18 cases against the rule violators. Some people tried to construct a wine shop opposite the Ambedkar Bhavan in Kudligi, in an insulting fashion. Following a complaint by Dalita Sangharsha Samiti, Anupama Shenoy initiated action against the same and arrested some persons who tried to construct the building violating the orders. "Minister Parameshwar Naik has, however, pressurised Anupama Shenoy and mentally harassed her to the extent that she tendered her resignation. This is not the first instance where an honest officer was made the scapegoat. Officers such as D K Ravi, Sonia Narang, Jagadish and others have also been pressurised by corrupt ministers with selfish motives," the seer said. He questioned Chief Minister Siddaramaiah why he was not taking a firm action on the issue. The state government should not accept the resignation of Anupama Shenoy, he urged. Youth Chamber president Shyam Sudarshan Bhat, Youth Chamber member K R Shetty Adyarpadavu and Rajakesari Youth Club, Ganjimutt, president Pravin Ganjimutt were present. Honesty and Sincerity does not have any value these days. If you want to last long in your duty you should be prepared to listen to the orders. If you are corrupt you can sustain in your powers.